Many of us have lived long enough to see a decline in customer service. When I was growing up and even as a young adult, serving a customer was more important than the sale itself. It was common knowledge that if you made a customer happy, he would return, again and again. Remember when you went the service station to get gas? You got SERVICE. Someone filled your gas tank, cleaned your windshield, rear window and side windows. Your oil was checked and if you needed, your tires were checked as well. You were offered the free item of the week, usually drinking glasses or coffee mugs. No matter what you are selling, you need to distinguish yourself as a personal service company. The strength of your company’s business should be the quality of your products, but your success is determined by the quality of service you provide. The founder of the famous catalog merchandising operation, L. L. Bean, flopped at his first attempt to sell his one product – hunting shoes. The rubber bottoms of the shoes parted from the leather uppers. But Bean guaranteed his customers’ satisfaction so he borrowed $400 to make good on the 90 faulty pairs out of the 100 he sold. Even though Mr. Bean is long gone, the company still offers good old-fashioned service, such as free replacement buttons for shirts – even if the shirt is 15 years old. This reputation of quality service has brought them great prosperity. This is the kind of service we expected and received a few decades ago. If we apply these same principles to our business today, we will stand out among the crowd. It takes minimal effort to go the second mile for a customer but it is worth every step. I have gained many friends who were customers first and kept coming back. Your reputation as a business owner precedes you and it speaks louder than any advertising you do. Never offer something you cannot perform. If you tell a customer you are going to deliver the product on Thursday, then make sure they get it on Thursday. If you cannot fulfill that commitment, then contact the customer and reschedule. Listen to your customer. There is nothing more frustrating than trying to explain to a merchant what you want and know they either don’t know what you are talking about or have no intention of performing what you ask. Deal with complaints. Never argue with your customer if they are unhappy. Figure out a way to make it right. Often customers have come in extremely upset because of the way their complaint was handled by our competition. When you don’t care about your client’s complaint, they will go elsewhere. Be helpful – even if there is no sale. I have had clients who need help with finding something I do not sell. I take the time to find it for them. No money in my pocket, but you can count on them returning. Answer questions honestly. If you don’t know the answer, find out. If you can’t find out, let them know. Free stuff. People like free stuff. If you throw in a little something extra at a small cost to you, they will remember that and tell others. Customer service is the sum total of doing many small things right – the way they ought to be done – in the interest of others. This is excellence at its best. It pays dividends beyond measure. Talk to me about customer service and I will tell you about success. They go hand-in-hand and there is no substitute. When it comes to customer service what have you experienced especially with online companies and what tips would you offer to help the budding entrepreneur? Much needed post, and your statement ‘talk to me about customer service, and I will tell you about success, really defines the importance. Successful businesses, online or offline that have excellent customer service, are extremely successful. Thank you Lawrence. I am sure you will agree that the opposite is also true. Went to dinner tonight and the waitress provided terrible service. It didn’t help that we waited so long for our food, that it was cold by the time it got to us. Will we go back? Very simple way of describing but very helpful indeed.. Cool post, Miss graham.. 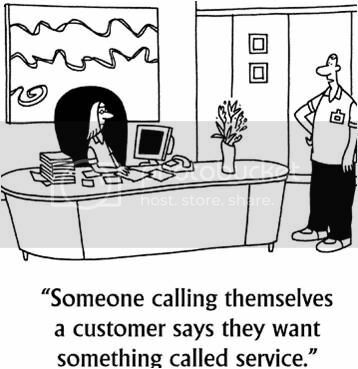 Customer service is a part of business.. But a customer service representative should not think that way.. You can’t satisfy your custoemers by thinking that, they will return back to you.. Rather the opposite is true, if you provide proper customer service, they will definitely come back to you.. I mean to say that, the representative should have a helping nature.. You can’t act to be helpful for your business, right?? You need have that nature.. This is Ron, Miss Graham..
Well done, Carol. This is exactly what is missing in so many places, today. It is especially appalling in fast food restaurants. I know they pay minimum wage, but that is no excuse for not training their employees properly and expecting them to give good service. If they don’t want to do their job properly, they do not have to work there. People wonder why I prefer Starbucks over Tim Hortons. Part of it is that I prefer the coffee, but an even bigger part is that Starbucks, at least where I have been, gives better customer service, BY FAR, than Tim Hortons. Perhaps that’s why they still outnumber Timmy’s considerably! Thanks Dave. I agree — I never go to Timmys unless we “have” to. We used to joke that you had to be devoid of personality in order to get a job. I know for myself I have had both experiences when it comes to customer service and yes it did affect my “loyalty” to that brand or store. Normally I give people a break when it comes to being “served” at a restaurant as an example, but I will not spend my hard earned money on food that is cold or not cooked properly. I agree with Dave that better training is required to teach people how to do their jobs better, but also feel that if you do not pay your employees properly, you get what you pay for? Online, customer service is also important and I am noting a lot of companies are getting more into the customer service “business” in a more meaningful way as people really are demanding a more timely solutions to their problems….. Thank you Carol for this great article on customer service. I remember the service stations where without asking they would wash your windows and ask if they could check under the hood for you. At least here in Oregon they still pump the gas for you but I think it is because they don’t want you spilling it on the ground or driving off with the pump handle still in the gas tank. 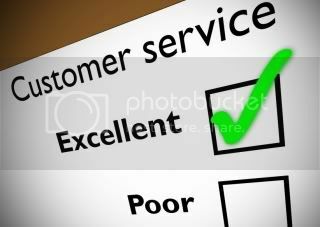 Customer service and follow-up is the highest priority in our own personal business both online and off. Thanks Ken. You are most definitely right.